Owning a horse (or even more than one) comes with lots of different responsibilities. From feeding to vet bills, exercise to hair care, there are plenty of problems and solutions that will need to be considered at some point. One such issue is that of protection from the elements while the horse is out on the field. Generally speaking, most horse owners will invest in a horse rug of some kind. These are ?sheets? of fabric that cover as much or as little as the horse?s body as possible. Rugs are available for a range of purposes; some are for keeping the horse warm in winter, others are for staying cool. One type of rug that always proves popular is the fly rug. Fly rugs are designed to keep a horse?s skin and coat protected against flies and other biting insects. 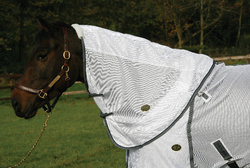 Generally, a fly rug will be designed to keep as much of the horse covered as possible while wearing it. The aim is to keep the horse?s skin from being exposed to any flying insects that could potentially land on and then bite the horse. Why are bites from flies bad news for horses? Well, among other things, a fly bite could result in a problem called sweet itch (well known among horse owners), as well as skin irritation problems. Flies landing on the horse can even cause stress and temper problems in certain individuals. Fly rugs are designed to restrict access to the horse?s skin and so keep it safe from harm and irritation. There?s a good reason that so many horse owners invest in fly rugs ? especially in warmer weather. It?s really all about the comfort of the horse. Are fly rugs required for the horse?s continued good health? Not always, no. But that doesn?t mean that a fly rug won?t make them more comfortable, especially when they?re out on the field. Fly rugs are easy to fit to most horses, and many feature a convenient belly strap to ensure total coverage of the horse?s skin and coat. The fact that they can be used year on year as necessary makes fly rugs a very wise investment for any horse owner. Plus they can be found for very reasonable prices at a range of different retailers. If you?re a horse owner and you?ve not yet invested in a fly rug for your horse, now might well be the time. When the weather is warm outside and flies are buzzing around, your horse will most definitely appreciate the extra level of protection they offer. And of course there are a host of other rugs available too ? 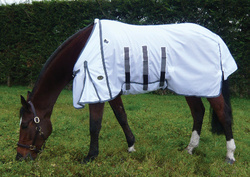 so if the hot weather is really bothering your horse, there?ll be a rug for that too! Fly rugs are good for your horse?s health, good for protecting it when it?s on the field, and affordable too ? so there?s every reason to pick one up.